Thinking about expanding your native pollinator forage offerings this season? 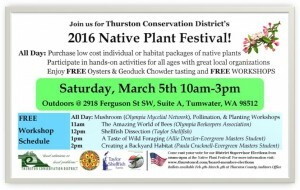 Look no further than the Thurston County Conservation District Annual Native Plant Sale this Saturday, March 6th from 10-3:00 pm at the district office in Tumwater. There will be displays, special presentations and activities and while you're there, stop by the OBA table and say "hello"! Weather permitting, we'll have our observation hive for an up-close look at our amazing honey bees. Everyone is welcome to attend the free presentations all day, including "The Amazing Honey Bee" at 11:00. We look forward to seeing you there!